An original head design, for sharp slide fall and evasiveness through cover. Fitted with a unique tempered round gape custom hook. The slightly standing fine brush guard’s elasticity helps it through thick cover, while improving the hook-up rate. 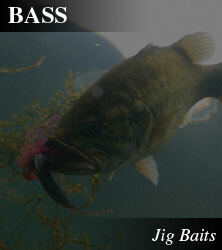 The GUNTER JIG series has been carefully designed to satisfy even the most experienced angler. GUNTER JIG FLIP has been designed especially for bulky soft baits. It is fitted with a wide gape #4/0 hook to improve hooking with extremely bulky trailers. Its shows it full potential in flipping situations where you end up pulling the fish and the weed together to the boat.